It is with deep sadness that we announce the passing of Past Fire Company President, Joseph D. Goss. Joe joined the Fire Company in January 1963 and served as President from 1987-1988, as well as numerous committees. 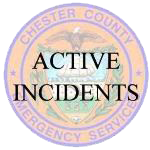 Joe also served as the Chairman of the SCCEMS (Southern Chester County Emergency Medical Services) Board of Directors from 1987-1990. Joe was a great supporter of SCCEMS and Medic 94, and was instrumental in the development of the organization in it's early years. Joe was also awarded the G. Alfred Taylor President's Award for outstanding service to the Union Fire Company No. 1 in 1993. The Union Fire Company No. 1 wishes to pass along condolences to the friends and family of Joe. We would also like to thank Joe for is countless years of service to our organization. Joseph Davison Goss, 75, of Colora, MD passed away on Monday, June 4, 2018 at Union Hospital, Elkton, MD. Born in West Chester, PA he was the son of the late Joseph E. and Virginia Davison Goss. Joe was a graduate of the Oxford Area High School, Class of 1960. He was active in sports while in high school as a member of the Varsity Soccer Team. He graduated from Goldey-Beacom College in Wilmington, DE. Joe retired from the County of Chester as a computer programmer. He served honorably in the United States Navy from 1960 – 1964. He would often recount his experiences as a member of the crew of the USS Alstede and their many med cruises across the Atlantic from Norfolk to the Mediterranean. As a result of his time in the Navy, Joe was active with numerous Veterans Organizations over the years. He volunteered at the Coatesville VAMC PTSD Program and the Vietnam Veterans Memorial in Washington, DC. He especially enjoyed traveling with friends to the Vietnam Memorial in Angel Fire, New Mexico, volunteering at the memorial during the Memorial Day Activities held there yearly. Joe was active in Cub and Boy Scouting, when he was younger and later as a leader and Scout Master as an adult. He attained the rank of Eagle Scout and was a member of The Order of the Arrow. He was a member of the Oxford Presbyterian Church and was a life member of the Union Fire Company #1 of Oxford with 55 years of service. 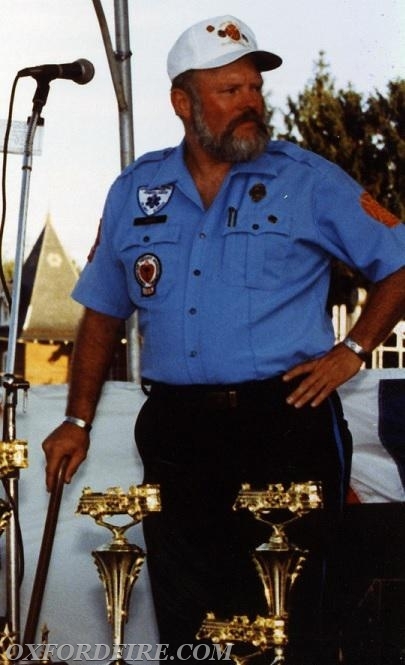 Joe served as Fire Company President in 1987 and 1988. He was also a member of the Vietnam Veterans of America, Roy W. Gibson Post #535 American Legion, Oxford, Disabled American Veterans and the VFW. Joe was also a volunteer with Medic 94 for many years and served as Chairman of the Board of Directors of Medic 94 from 1987 to 1990. He enjoyed growing roses, country music and was an avid book reader. 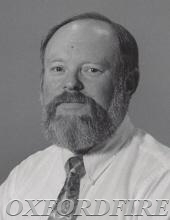 He is survived by one son, Joseph Charles Goss of Sanford, NC; two daughters, Cheryl Moran of Colora, MD and Joanne Tyler (Mark) of Sanford, NC; four grandchildren, Brad Foust, Teresa Henskee, Jamilyn Moran and Justice Rowe; one great-granddaughter, Cara Rentschler; and one brother, James R. Goss (Kathy) and their son, Brian Goss (Cindy) all of Oxford. Joe took the to mic to announce the passing units during the 125th Anniversary parade. 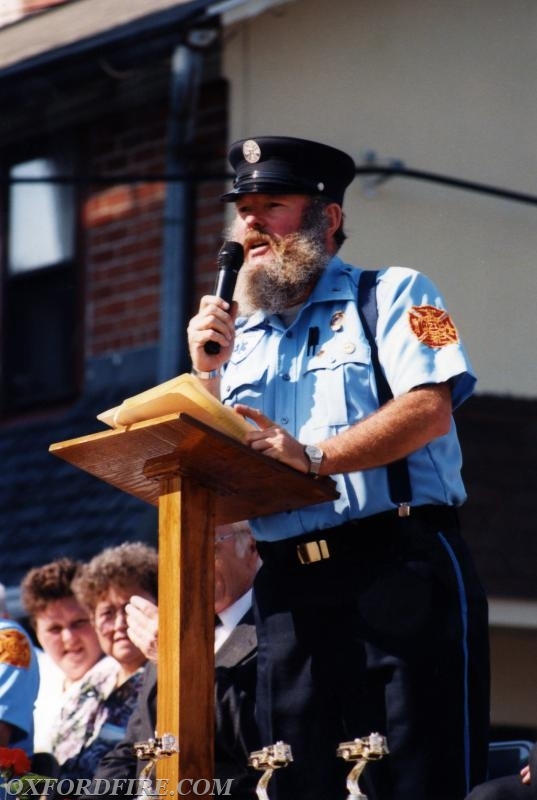 Joe as the Master of Ceremonies of the Joint Housing with the West Grove Fire Company 1993. 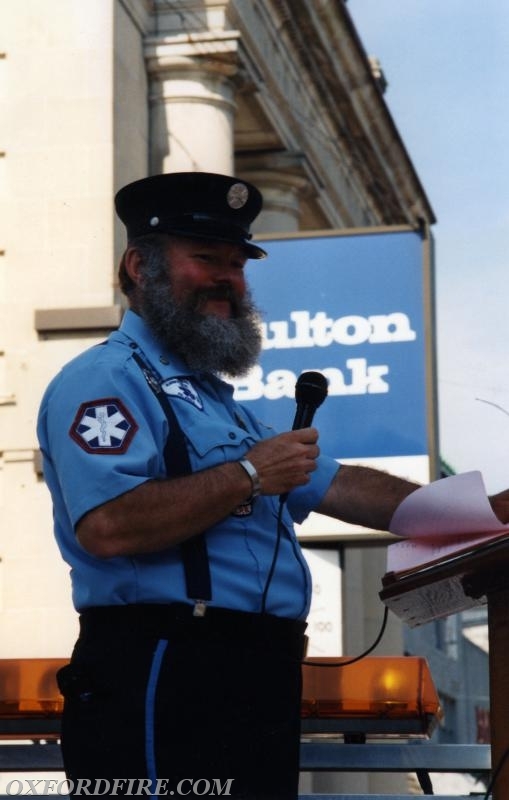 Joe as the Master of Ceremonies at our 125th Anniversary celebration in 1996. 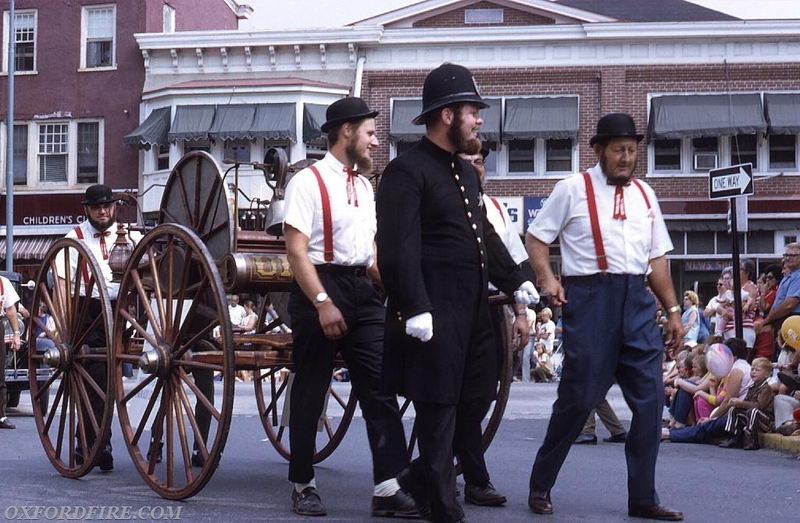 Joe lead the pulling of our Hose Cart in the 100th Anniversary parade 1971.